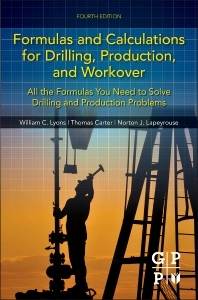 Formulas and Calculations for Drilling, Production, and Workover, All the Formulas You Need to Solve Drilling and Production Problems, Fourth Edition provides a convenient reference for oil field workers who do not use formulas and calculations on a regular basis, aiming to help reduce the volume of materials they must carry to the rig floor or job site. Starting with a review of basic equations, calculations, and featuring many examples, this handy reference offers a quick look-up of topics such as drilling fluids, pressure control, engineering calculations, and air and gas calculations. The formulas and calculations are provided in either English field units or in metric units. This edition includes additional coverage on cementing, subsea considerations, well hydraulics, especially calculating for hydraulic fracturing methods, and drill string design limitations. This practical guide continues to save time and money for the oil field worker or manager, with an easy layout and organization to help confidently conduct operations and evaluate the performance of wells on-the-go.